, President Obama hosted the first online Town Hall meeting with questions submitted and voted on via the internet. The Developer team at Google is honored that two of our technologies, App Engine and Google Web Toolkit, played a role in making this possible. Google Moderator, built with App Engine and Google Web Toolkit, allows users to submit and vote on questions collaboratively. 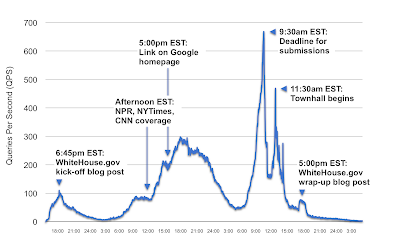 Originally developed for Google company meetings, it's now available for anyone to use -- but being featured on WhiteHouse.gov offered an unprecedented level of potential traffic and attention. We are thrilled that, thanks to scalable hosting provided by App Engine, Moderator successfully handled traffic from tens of thousands of simultaneous visitors. During the 48-hour open voting period, the site peaked at 700 hits per second, and 92,934 people submitted 104,073 questions and cast 3,605,984 votes. In total, over one million unique visitors visited the site before the town hall. Even while the site was featured on major news outlets and even the Google homepage the other 50,000 apps built on App Engine were fully supported and experienced no adverse effects. As would be expected when a website is utilized by the White House and is featured in the media, there were dramatic, and sometimes unforeseen, upswings in traffic. The graph below shows some of the major surges in load to which App Engine adapted. Conventional web hosting strategies demand the pre-provisioning of enough servers to handle load. Sometimes, as was the case with Moderator on WhiteHouse.gov, accurate traffic estimates can be difficult to develop ahead of time. Fortunately, since Moderator runs on App Engine, all servers and resource allocation were handled automatically. With App Engine, you never need worry whether you've set up enough machines...we'll automatically spin up new servers as traffic grows. If you haven't tried App Engine yet, we encourage you to join the 150,000 developers who have already built highly scalable web applications on top of Google's computing infrastructure. To learn more, visit code.google.com/appengine/ and make plans to attend our sessions at I/O at the end of May. Last Thursday was a momentous day for citizen participation in government. As you may have heard, President Obama hosted the first online Town Hall meeting with questions submitted and voted on via the internet. The Developer team at Google is honored that two of our technologies, App Engine and Google Web Toolkit, played a role in making this possible. Moderator is a great tool! Are we able to track or have access to the type of data that you collected for The White House for our Moderator series? One of the things I am struggling with is tracking data for evaluation.